Register and get your tickets here. Please read the terms and conditions below. These tickets are only for participants of TIIMI Academic Conference, Indonesian Scholars Forum, and Gala Cultural Night. Ticketing mechanism for the presenters and essays’ author will be announced on 10 August 2015. 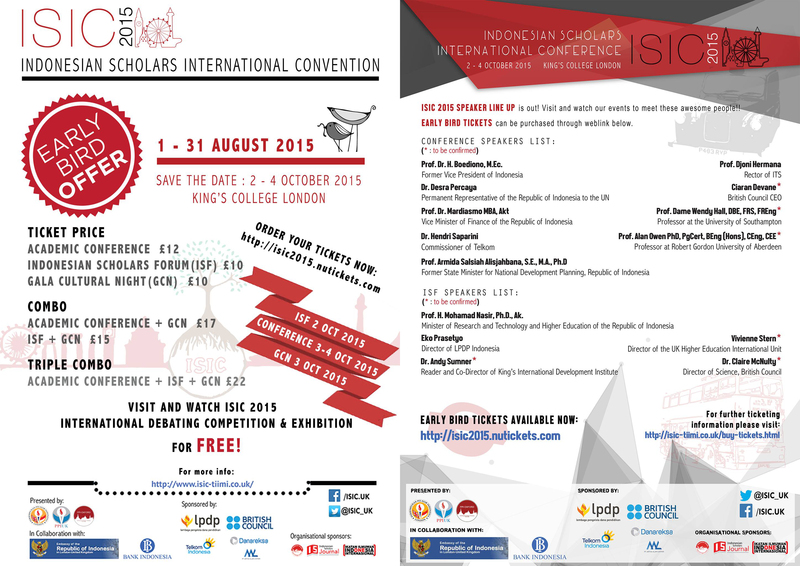 Please remember that the event of Indonesian Scholars Forum (ISF) are only for minimum a PhD student. In order to organise certificate printing process, for every collective purchase (more than 1 ticket order) MUST send an email of the list of participants’ full name to marketing@isic-tiimi.co.uk with ticket number as a subject email. The tickets are NOT refundable. For those who need a supporting letter for travel application documents could fill this form. Do you have a question regarding to ticketing? Please refer first to our FAQ, or contact marketing@isic-tiimi.co.uk with further queries.